"Expectation is the root of all heartache"
Coming to England, I had great expectations of what Europe should look like and how it should feel. According to Shakespeare, I set myself up for great disappointment, but I don't believe I did. From a young age, I've dreamed of visiting foreign places and, though different from what I expected—Hollywood adventures in picture perfect villages—this country has and continues to exceed my expectations with stunning realism and authentic European charm. 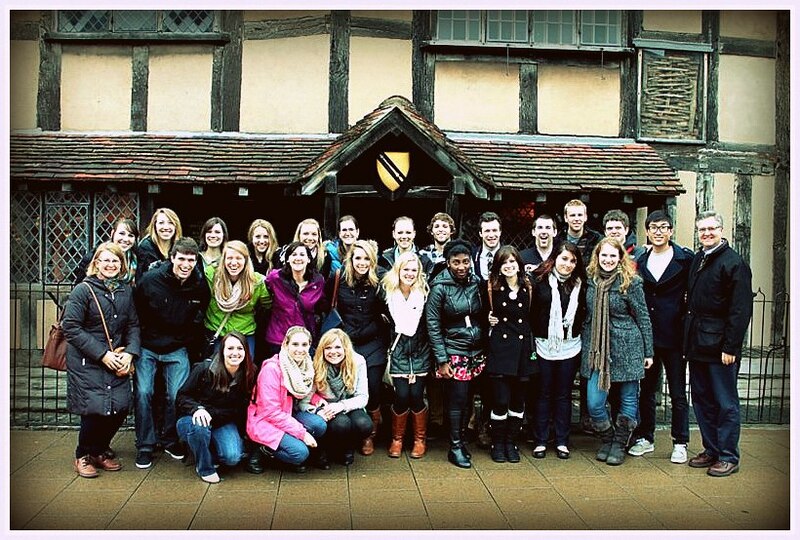 A few days ago, my class set out as Saturday tourists venturing beyond the boundaries of York to Stratford-Upon-Avon, Shakespeare's hometown. Yet again, England's charm exceeded my expectations—I believe I would have visited regardless of Shakespeare's presence. Our trip began with a 4 hour coach ride that should have taken only 3 hours if we had not waited endlessly in a dead-still traffic jam—nearby cars emptied out into the 3-lane highway as if we were parked on a ferry, people smoked and chatted beside the concrete dividing wall. Regardless of this detour (the source of the jam remains a mystery), we arrived in Stratford just in time for our scheduled event: The Winter's Tale performed by the Royal Shakespeare Company. Finally, a Shakespeare play that ends with triumph and redemption rather than death and tragedy! Having never read the play, besides a synopsis on SparkNotes, I walked into the auditorium with little preparation and no expectation to find a colorful, silk-covered stage with a modestly-sized balcony-tower center stage. But the show was everything except modest: grade A actors, elegant costumes, and a 25-foot rising tower! I laughed, I scoffed, and, shamelessly, I cried, and afterwards, I knew I had experienced something fantastic when 3 hours passed in what I thought had only been an hour. To top off the day, we walked a block down the narrow European streets, dodging speedy cars and careless drivers, to the street-side home of William Shakespeare himself—that is if you believe he existed. But what does it matter whether he lived or whether those wooden walls actually housed this great English writer, because either way, Shakespeare's plays will continue to go down in history regardless of whether he existed. He's just that good.